What could be better than a "gourmet" grilled cheese sandwich? And what could be better than cooking it in 5 minutes flat on my mini George Foreman grill? The "gourmet" starts with the cheese in this sandwich: smoked mozzarella, which is chewy, smoky, and meaty tasting. In fact, I would recommend going out of your way (like I had to) to find the smoked version; regular mozzarella would just not be a good substitute. Next come the tangy-sweet sun dried tomatoes, which add bursts of flavor in every bite. Finally, fresh basil leaves top everything off and add a sweet, herbal bite. 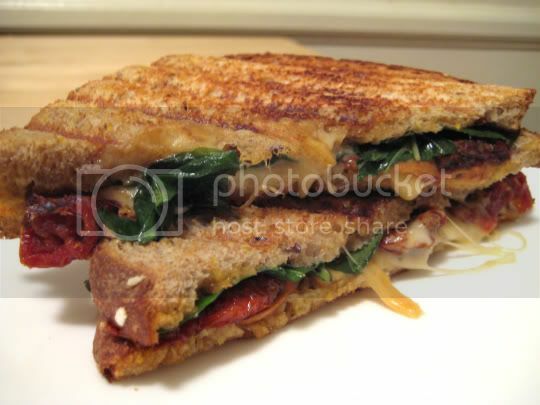 I used Milton's Multi-Grain bread, which is excellent pressed for this panini-style sandwich. I had to double the "filling" ingredients to make this a substantial sandwich, but it was a filling and wonderful meal. I could eat this for days straight!